Product categories of Fabric Over Foam Gasket, we are specialized manufacturers from China, Fabric Over Foam Gasket, Emi Shielding Fabric Over Foam Gasket suppliers/factory, wholesale high-quality products of Fabric Over Foam Emi Gasket R & D and manufacturing, we have the perfect after-sales service and technical support. Look forward to your cooperation! FOF GASKET Wrapped open cell pu foam by Cu+Ni conductive fabrics,black fabric or aluminum foil used for EMI-RFI shielding. 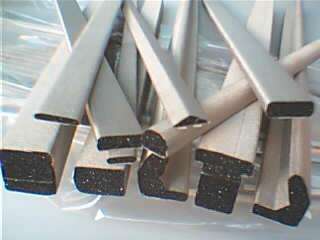 Any shapes, size and I/O or D-SUB gasket are avaliable as customer design. The most popular are rectangular shape ,D shape,Bell shape ,C fold or P shape.